Thinkerbell likes "It's a Wonderful Life" so I tolerate it. The Muppet Christmas Carol is the best Christmas Carol. The had a live performance of a Christmas Story on TV a few days ago. I missed it. Did anybody catch it? I smoke cigars with one of the owners of the play production. He says he has the original Leg Lamp prop in his house. Mostly the classics. It's a Wonderful Life. 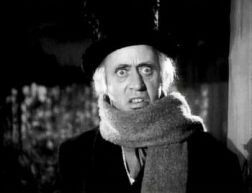 Christmas Carol (1938). Miracle on 34th Street. Little Lord Fauntleroy (1980 although that's not really a Christmas movie until the very end). I also love the ones valgal and luckystar mentioned. As far as the shorter shows, my mom and I love Christmas Eve on Sesame Street, Garfield's Christmas, A Chipmunk Christmas, and Merry Christmas Charlie Brown. There is also a nice one called The Stableboy's Christmas. And I love the Nativity Story from several years ago. Oh, and while the original is best, I also kind of like the re-make of Miracle on 34th Street which I have and watched earlier. And I also watched All I Want for Christmas.